This article is about the fastener. For other uses, see Latch (disambiguation). 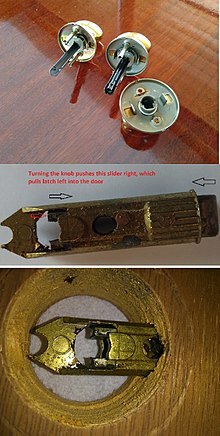 A latch or catch (called sneck in Northern England and Scotland) is a type of mechanical fastener that joins two (or more) objects or surfaces while allowing for their regular separation. A latch typically engages another piece of hardware on the other mounting surface. Depending upon the type and design of the latch, this engaged bit of hardware may be known as a keeper or strike. A latch is not the same as the locking mechanism of a door or window, although often they are found together in the same product. Latches range in complexity from flexible one-piece flat springs of metal or plastic, such as are used to keep blow molded plastic power tool cases closed, to multi-point cammed latches used to keep large doors closed. A single-throw bolt. The bolt can be engaged in its strike plate only after the door is closed. The locking mechanism typically prevents the bolt from being retracted by force. Knob has crescent-shaped bar which pulls back latchbolt when turned. Version on upper right has a lock; version on upper left does not. Kwikset uses this shape. Other companies have square or D-shaped bars. Latchbolt or Latch bolt An extremely common latch type, typically part of a lockset, it is a spring-loaded bolt with an angled edge. When the door is pushed closed, the angled edge of the latchbolt engages with the lip of the strike plate; a spring allows the bolt to retract. Once the door is fully closed, the bolt automatically extends into the strike plate, holding the door closed. The latchbolt is disengaged (retracted) typically when the user turns the door handle, which via the lockset's mechanism, manually retracts the latchbolt, allowing the door to open. Deadlocking latchbolt (deadlatch) is an elaboration on the latchbolt which includes a guardbolt to prevent “shimming” or “jimmying” of the latch bolt. When the door is closed, the latchbolt and guardbolt are retracted together, and the door closes normally, with the latchbolt entering the strike plate. The strike plate, however, holds the guardbolt in its depressed position: a mechanism within the lockset holds the latchbolt in the projected position. This arrangement prevents the latchbolt from being depressed through the use of a credit card or some other tool, which would lead to unauthorized entry. Draw Latch is a two part latch where one side has an arm that can clasp to the other half, and as it closes the clasp pulls the two parts together. Frequently used on tool boxes, chests, crates and windows. Doesn't need to be fully closed to secure both halves. A slam latch uses a spring and is activated by the shutting or slamming of a door. Like all latches, a slam latch is a mechanism to hold a door closed. The slam latch derives its name from its ability to slam doors and drawers shut without damaging the latch. A slam latch is rugged and ideal for industrial, agricultural and construction applications. A Norfolk latch is a type of latch incorporating a simple thumb-actuated lever and commonly used to hold wooden gates and doors closed. In a Norfolk latch, the handle is fitted to a backplate independently of the thumb piece. Introduced around 1800–1820, Norfolk latches, originating in the English county of the same name, differ from the older Suffolk latch, which lacked a back plate to which the thumbpiece is attached. A Suffolk latch is a type of latch incorporating a simple thumb-actuated lever and commonly used to hold wooden gates and doors closed. The Suffolk latch originated in the English county of Suffolk in the 16th century and stayed in common use until the 19th century. They have recently come back into favour, particularly on garden gates and sheds. They were common from the 17th century to around 1825, and their lack of a back plate made them different from the later, and neighbouring Norfolk latch (introduced 1800–1820). Both the Suffolk latch and Norfolk latch are thought to have been named by architectural draughtsman William Twopenny (1797-1873). Many of these plates found their way into America and other parts of the world. A crossbar, sometimes called a bolt, is a primitive fastener consisting simply of a post barring a door. Crossbars were historically common, simple fasteners consisting simply of a plank or beam mounted to one side of a door by a set of cleats. The board could be slid past the frame to block the door. Alternatively, the bar can be a separate piece that is placed into open cleats or hooks, extending across the frame on both sides. The effect of this device is essentially the opposite of the crash bar in that its operation is to permit the door to be opened inward rather than outward. On a set of double doors, the same principle works, but needn't extend past the frame. The bar simply extends into another set of cleats on the other door such as to interfere with the door opening. A cabin hook is a hooked bar that engages into a staple. The bar is usually attached permanently to a ring or staple that is fixed with screws or nails to woodwork or a wall at the same level as the eye screw. The eye screw is usually screwed into the adjacent wall or onto the door itself. Used to hold a cupboard, door or gate open or shut. A cabin hook is used in many situations to hold a door open, like on ships to prevent doors from swinging and banging against other woodwork as the ship moves due to wave action. This usage spread also to other domains, where a door was required to be held open or a self-closing device is used to close the door. Many buildings are built with fire-resistant doors to separate different parts of buildings and to allow people to be protected from fire and smoke. When using a cabin hook in such a situation, one should keep in mind that a fire-resistant door is an expensive and heavy item, and it only works as a fire door if it is always closed. To open the often heavy fire door easily, magnetic door holders are used that are released when the buildings electrical fire alarm system is activated by a fire. As cabin hooks must be activated manually, they are impractical for fire doors. Also named draw latch or draw catch. It has a claw or a loop that catches the strike plate (named catch plate in this case) when reaching a certain position. A pawl is a latch that will allow movement in one direction, but prevents return motion. Commonly used in combination with a ratchet wheel. A latch of some type is typically fitted to a door or window. Many types of weaponry incorporate latches with designs unique to the weapon. Firearms require specialized latches used during loading and firing of the weapon. A break-action firearm is one whose barrels are hinged and a latch is operated to release the two parts of the weapon to expose the breech and allow loading and unloading of ammunition. It is then closed and re-latched prior to firing. A separate operation may be required for the cocking and latching-open of a hammer to fire the new round. Break open actions are universal in double-barrelled shotguns, double-barrelled rifles and combination guns, and are also common in single shot rifles, pistols, and shotguns, and can also be found in flare guns, grenade launchers, air guns and some older revolver designs. Several latch designs have been used for loading revolvers. In a top-break revolver, the frame is hinged at the bottom front of the cylinder. The frame is in two parts, held together by a latch on the top rear of the cylinder. For a swing out cylinder, the cylinder is mounted on a pivot that is coaxial with the chambers, and the cylinder swings out and down. Some designs, such as the Ruger Super Redhawk or the Taurus Raging Bull, use a latches at the front and rear of the cylinder to provide a secure bond between cylinder and frame. To fire a revolver, generally the hammer is first manually cocked and latched into place. The trigger, when pulled, releases the hammer, which fires the round in the chamber. Various types of knives with folding or retractable blades rely on latches for their function. A switchblade uses an internal spring to produce the blade which is held in place by a button-activated latch. Likewise a ballistic knife uses a strong latch to restrain a powerful spring from firing the blade as a projectile until triggered by opening the latch. A gravity knife relies on a latch to hold the folding blade in an open position once released. A balisong uses a single latch to hold the folding blade both open and closed, depending on the position of the handles; by rotating 180 degrees the same latch can be used in either configuration. Balisong latches have numerous variations, including magnetic variants and some which can be opened via a spring when the handles are squeezed together. Utility knives also often use a latch to hold a folding knife both open and closed. This allows it to be locked in orientation to the handle when in use, but also safely stowed otherwise. To open a knife of this type may require significantly more force than the weapons variety as an added safety feature. Crossbows incorporate a type of latch to hold the drawn bowstring prior to firing. Automobiles incorporate numerous special-purpose latches as components of the doors, hood/bonnet, trunk/boot door, seat belts, etc. On passenger cars, a hood may be held down by a concealed latch. On race cars or cars with aftermarket hoods (that do not use the factory latch system) the hood may be held down by hood pins. The term Nader bolt is a nickname for the bolt on vehicles that allows a hinged door to remain safely latched and closed. It is named after consumer rights advocate and politician Ralph Nader, who in 1965 released the book Unsafe at Any Speed which claimed that American cars were fundamentally flawed with respect to operator safety. Latches in seatbelts typically fasten the belt which constrains the occupant to the body of the car. Particularly in rear seats slightly different latches may be used for each seat in order to prevent adjacent seatbelts from being attached to the wrong point. Inertial seatbelt release is a potential circumstance where, in a collision, the seatbelt latch can unintentionally come loose leading to potential injury of the passenger. 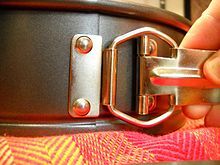 An additional risk of seatbelt latches is that in some cases the occupant may believe the latch is secure (e.g., by hearing a characteristic click) when in fact it has not. A parking pawl is a device that latches the transmission on automatic vehicles when put in park. A spring latch (in this case a over-center-latch) is used to hold the walls of a springform pan in place. ^ "Basic Technical Fundamentals of Builders Hardware Mortise, Bored and Auxiliary Locks". Sargent Manufacturing Company, an ASSA ABLOY Group company. Archived from the original on 2012-09-07. Retrieved 2014-09-26. ^ "Cam latch". McMaster-Carr. Retrieved 2008-10-17. ^ "Suffolk Latches". Hand Forged Traditional Ironmongery. 17 June 2007. Archived from the original on 19 February 2012. ^ Porter, Brian; Christopher Tooke (2007). Carpentry and Joinery 3. Butterworth-Heinemann. p. 200. ISBN 978-0-7506-6505-6. ^ Beazley, Elisabeth (1990). Beazley's Design and Detail of the Space Between Buildings. Taylor & Francis. p. 230. ISBN 978-0-419-13620-0. ^ Blanc, Alan (2014-10-29). Internal Components. Routledge. ISBN 9781317893950. This page was last edited on 20 August 2018, at 20:28 (UTC).